Full disclosure: I work for a makeup company. My job can be a fun. I work with an incredible group of talented, hard-working women who, like me (like all of us, I’d venture to guess) love aesthetically pleasing things: beautiful, lush colors. Soft, smooth things that feel featherweight when we touch them. And of course, we all want to feel good about how we look. My face looked even and healthy and all my favorite features were accented just so! I looked awake! I looked…wait a minute. Was that a zit? Hmmm. I chalked it up to PMS. Only, my skin never really cleared up. These zits were different. They were like zits that never cleared up. They almost looked like blistery, angry bumps. The more I tried to cover them, the worse they got. Like any vain woman concerned about her looks, I turned to Google and started reading about people who had similar symptoms. I self-diagnosed (don’t judge me) and decided I had a sort of dermatitis. The more I dug, the more I discovered that often, common ingredients in shampoos, cleansers and cosmetics create and exacerbate dermatitis. I started reading about coconut oil and its healing powers. I began paying attention to the laundry list of ingredients—words I couldn’t even begin to pronounce but are found in thousands of products we use daily—in my facial cleansers, moisturizers and yes…my makeup. So I purged. Out went the cleansers and moisturizers. Goodbye, body lotions. Imagine how much bigger my NYC bathroom felt once all these items were thrown away and replaced by a single jar of coconut oil! And my primers, foundations, setting powders, bronzers, numerous blushes, lipsticks…well, they went, too. But then a funny thing happened. My skin began to clear. That glow and even skin tone I had been achieving with makeup? Turns out kale smoothies, lots of water and a healthy skin routine creates them naturally! Truthfully, I still wear makeup. I’m a huge fan of RMS Beauty and I am excited to try Beautycounter’s new line of color cosmetics—both brands have a laundry list of ingredients they won’t use in their products. I still wear mascara and haven’t given up all of my blushes or eyeshadows. But every choice I make for my skin, and for the planet, has empowered me to be an informed consumer and advocate for myself and the women I love. That makes me feel more beautiful than makeup ever could! 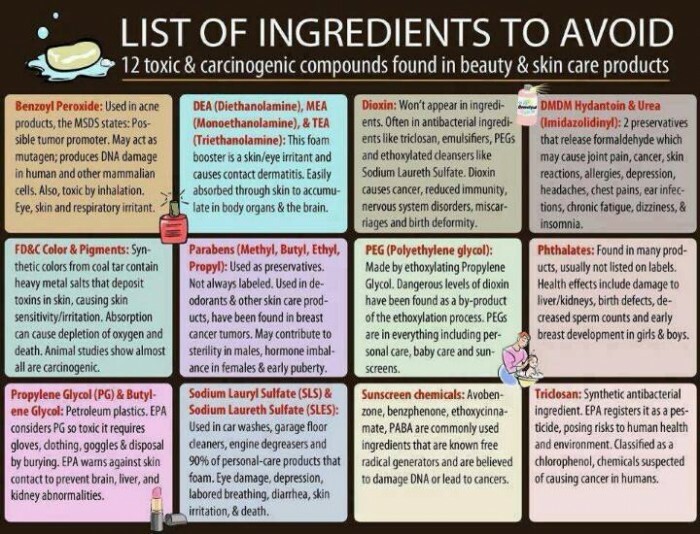 Great post and thanks for the list….Long ago I got rid of all that stuff in what I use, but most people really don’t know what they are.